We want to shed light in the debate about NAMAs and encourage policy-makers in their efforts to enhance sustainable transport measures. This handbook provides conceptual background information and practical guidance on transport NAMAs. Its objective is to facilitate the preparation and implementation of Nationally Appropriate Mitigation Actions (NAMAs) in the transport sector to increase the sector’s contribution to mitigate climate change. The handbook was developed over a period of several years in an iterative, participatory process closely linked to a broad range of activities of the GIZ TRANSfer Project, including a broad review process with a large group of NAMA practitioners. It presents practical experience with transport NAMAs, including GIZ’s vast field experience in a concentrated and action oriented way, in order to support and stimulate the development of further transport NAMAs. 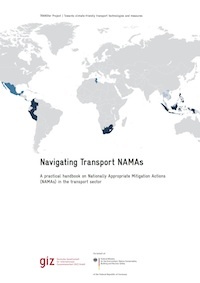 The handbook is complementary to the UNFCCC NAMA Guidebook 2, which gives more general guidance on NAMAs without a particular sectoral focus, while this handbook elaborates further on transport sector specific issues. The focus of this handbook is on NAMA preparation. Some additional information is given on the implementation of NAMAs. The chapters conclude with a handy checklist and tips for the Topic.